How big is a standard croquembouche? 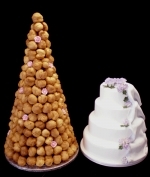 This 400 piece croquembouche is shown next to a 4 tier (12″ 10″ 8″ 6″) stacked wedding cake to demonstrate the impact of your wedding centrepiece. The impact of the smallest size (120 pieces) is similar to a traditional two tier wedding cake. If you are serving it as wedding cake, allow 1 piece per person plus an extra 20% or so, and for dessert allow 3 pieces per person. Croquembouche fillings and flavours What is a croquembouche or piece montee?